The Itty Bitty Kitty Committee: It's Maxine Monday! All Maxine, all day long! 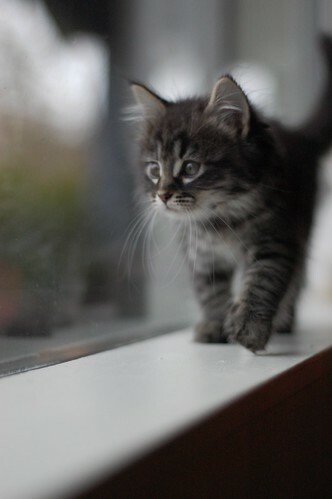 First up, our adventurous little girl has discovered the front window. There's so much to see out there and she loves soaking it all in! Wow, Maxine is intent on that window! Such focus, such attentiveness! She's a shoe-in for the CIA -- Cat Intelligence Agency. She has such nice, solid-looking gams! Awww, sweet chubby little paws! She is so beautiful! What an abundant spray of whiskers she has! Just like my girl Zellie. She is sooo floofy! Love! Those whisker freckles are fantastic!